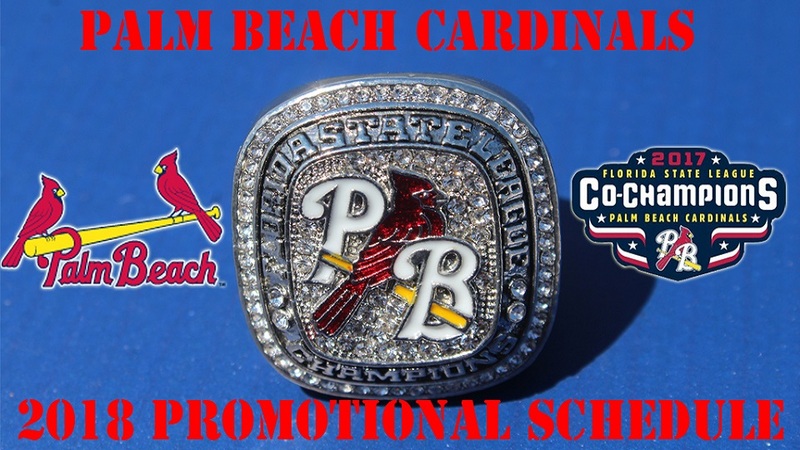 The reigning Florida State League Co-Champions Palm Beach Cardinals are excited to host an exciting promotional scheduled filled with fun, zest and flavor for all ages. Starting on Friday, April 6th, the first 500 fans through the gates of Roger Dean Chevrolet Stadium will receive a replica FSL Championship ring which are just like the ones players received after their exciting 2017 season. On May 4th, join us for a night of Faith, Family, and Fellowship. Church groups will be in great attendance; we will have a pre-game invocation, and in-game player testimonies. On Kentucky Derby Day, May 5th, we'll be holding a special Derby Hat Contest, serving Mint Juleps and the illustrious race has inspired a night of Horsing around with the Cardinals. "Best Bet" you'll have a great night. Sunday May 6th is Mats & Bats Day at Roger Dean Chevrolet Stadium. An Hour of Yoga 11:15a-12:15p on a BIG League playing field led by renowned Yoga enthusiast Elisa Mott-Jones, from TRIBE studio. Advanced registration is recommended. Friday May 18th - Broken iPhone-Screen Amnesty Night - whether your screen met its demise at a baseball game, during a tumble, a toilet-mishap, a break-up … there will be no-questions asked! Come to the game, and sign-up to win one of 9 free iPhone screen repairs. One per inning done on the spot! Thursday May 24th - Journalism Camp 101. Ever wanted to learn the life of scribe? Get a comprehensive "Night in the Life" of a Sports Reporter. Learn from a host of respected industry members. From Pre-Game to the Post-Game interview, this is a great "behind the scenes" experience. Advanced registration is recommended. On June 9th, the Cardinals will host Girl Scout Night. Prior to the game, there will be a parade around the warning track of all the troops in the Palm Beach Area. Each Girl Scout in attendance will receive a special commemorative patch. Following the game, there will be an inspirational guest speaker that will talk to all troops in attendance. Also on June 9th is Halfway to Halloween presented by Halloween Express, Palm Beach Children's Hospital and Palm Beach Gardens Medical Center. All kids ages 15 and under are encouraged to wear a Halloween costume so they can look their best trick-or-treating throughout the concourse. There will be a costume contest with a prizes for the best costumes. Prior to the game, there will be a helicopter - Yes, a helicopter - that will be dropping candy for the children in attendance to pick up. June 21 will be Night of Owls, celebrating our friends over at Florida Atlantic University. Football head coach Lane Kiffin will be the special guest and will be throwing out the ceremonial first pitch. You'll want to come to the Roger Dean Chevrolet Stadium. Sail Away Night will take place on Saturday, June 23rd. Each half inning, there will be a special, exciting excursion that will be given out. At the end of the seventh inning, one lucky fan will win the grand prize giveaway. All excursions that will be given away are able to be redeemed in the Palm Beach area. Splash Days - The Coolest Days of the Year - will be hosted on June 28th and July 17th. Sunscreen, Bathing Suits, Towels and smiles are the call of the day on Splash Days! All game long, there will be flying water balloons and other activities that will help the kids stay cool at the ballpark. Our biggest event of the year, Mega Bash, will be happening on Wednesday, July 4. Come celebrate Independence Day with us as we will have a MEGA kid's area that includes bounce houses, games and other inflatables. After the game, there will be fireworks. Christmas in July will be returning on Saturday, July 21st. Join us as we turn Roger Dean Chevrolet Stadium into a Winter Wonderland. We'll be enjoying Holiday carols, hosting a 'Salvation Army' donation station and our Cardinals will be in themed jerseys that you'll be able to bid on all-game long! Also, what would be a Christmas celebration without an appearance from Santa Clause? There will also be authentic snowballs which will give kids who have never seen snow before, the opportunity to, while still being in warm and sunny Palm Beach. Every home Sunday Palm Beach Cardinals games are Masters Sundays. The Cardinals will wear red jerseys on the field, and by coming to the game in red, you can win too! We'll be giving away rounds of golf to tome of the finest courses in the Jupiter Area. For the first time, we are unveiling a specialty concession item. Try out the Cardinal SIN-Dog. A hot dog made with onions and peppers, dressed with plenty of ketchup. We will continue with our terrific Baseball Buddies program, presented by SURF TACO The Baseball Buddies package allows your group of 15 or more to take the field with the Cardinals players during the National Anthem. Following the Anthem, the group will be given the microphone to yell, "Play Ball"! This is a great way to reward a team and enjoy a fun-filled night at the ballpark. Players & Coaches are FREE. Friends & Family are $6.00 each. For more information on these promotional nights, please call (561) 775-1818.